September is a tricky month because it's not warm enough to wear shorts nor cold enough to wear jeans ... or maybe we're not mentally ready to wear jeans yet? Either way, if you can't let go of the warmer weather but you don't want to look ridiculous in cut-off shorts, a midi skirt is the right way to go. This must-have transitional piece will keep your legs warm while still carrying on the summer spirit. 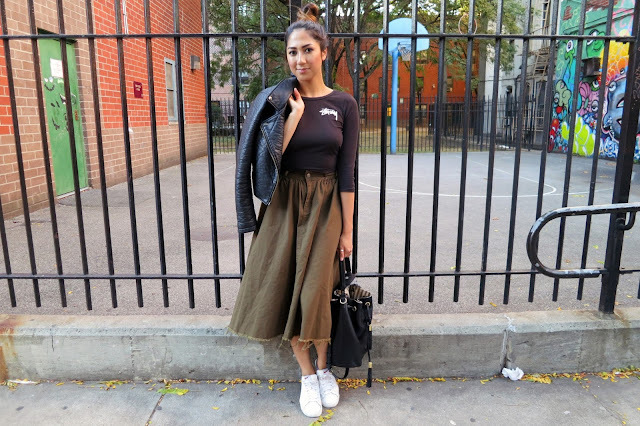 Forever21's midi skirt is perfect for the change in weather because it's available in my favorite autumn hues (olive and khaki) and the frayed trimming makes it casual enough to wear with my favorite closet staple, sneakers. 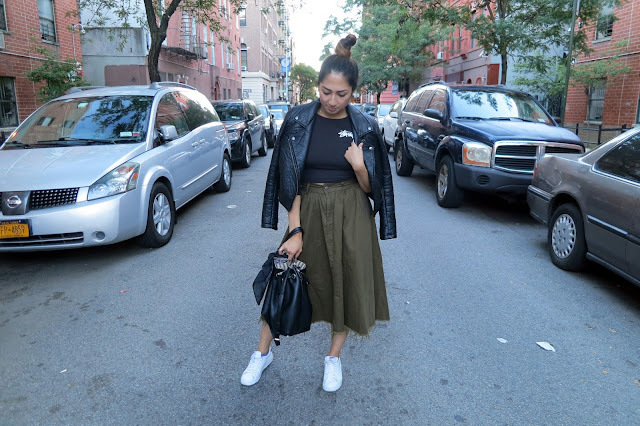 Pair the skirt with your favorite top (try a bodycon shirt or a crew neck sweater) and leather jacket and you will be ready to conquer fall! This oufit is so PERFECT <3 !!! !